How can we fight back against the overwhelm? Stress can crush us if we let it. Why does stress happen? How can we fight back against the overwhelm, or against the fear that are the underpinnings of what stress really is? What is stress? There are two main types of stress. Distress, and eustress. One is negative, and the other has positive potential. Neither are comfortable. Distress is when we are fearful, frantic, and faithless. Eustress is when there is pressure, performance, or progress. The former is what we all consider stress. The latter is challenging but beneficial — stress with a purpose long term. When distress strikes, our bodies release hormones that can compound its effects. Adrenaline, cortisol and an array of bodily reactions engage to activate our fight or flight response. The same response that has been part of our biology for thousands of years — it serves a purpose. However, in today’s society, it is overactive and rarely for true survival purposes. We tend to freak out and engage our deepest survival instincts over what ends up being trivial in the big picture. Because of this, we are at a disadvantage if we ever needed to react in a real life or death situation. Also, long-term activation of this system can cause adrenal fatigue and have a host of health problems. Managing our reactions, emotions, and propensity for distress are so integral to thriving in our short lives. Time spent panicking, and preoccupied doesn’t feel good, and it cannot be recovered. Eustress is an interesting phenomenon. Good stress. Two people can have the same project at work, and one can have a distressful response, while the other can interpret it as eustress. Why? How? The person who chooses eustress is detaching from the situation and choosing their response. They shift their frame of reference consciously. Deciding to view the project as a challenge, and putting it in perspective to the bigger picture of their lives. 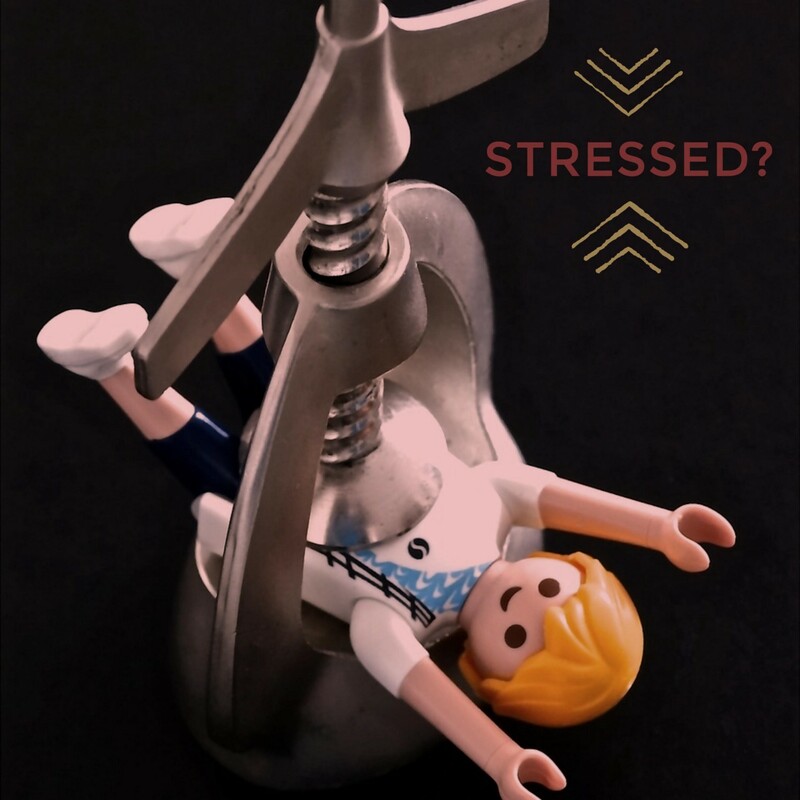 Switching from distress to eustress is what people often perceive as being able to “handle stress”. Both people experience stress, but both experience it differently. One person reacts and lets their body’s biochemistry take over. The other chooses an empowering meaning to the situation and rises up to the challenge. Choosing eustress is also easier when we stop overly immersing ourselves in the details at hand. We need to zoom out to see the entirety of not only the project, but our lives. Is this worth freaking out about 1, 5, or 10 years from now? Will I look back from my old age and be impressed that I was so concerned with what ultimately ended up being a minor blip? Probably not. So now, knowing about the two types of stress we face, what can we do to prepare and prioritize? I have a few ideas and tools to try out. Acceptance, awareness, and attitude. So, we have come to a point where we feel distressed about our circumstances, responsibilities, and maybe life itself. What do we do? Accept it. Resisting is exhausting. The more we agonize, the less we accomplish, and the longer we have to suffer. Getting past that is key. Assessing the situation neutrally, or Stoically is what to aim for. Rather than saying “this is awful, it is causing me stress.” Or something like that. We can choose a more neutral “This is happening, it is temporary, I will endure.” The event, project, or stressor is happening. Accepting it and using energy to calm down and find a solution is the only way to ever surpass the situation. Knowing is half the battle. Knowing there are two distinct kinds of stress, and that our power of choice can determine which we experience can change our lives. Awareness of whether we are experiencing the chaos of distress or the calm confidence of eustress in any moment. Taking a second to ask ourselves is this exhausting or empowering? Rather than reacting we use our minds and direct their energy through questions and observation. We only have a short time to live — knowing this we can decide that it’s not worth getting so stressed out. Being a big ball of stress is not even helping the situation if we are honest with ourselves. Remaining aware of our power to choose our responses, and ultimately our reality in any stressful situation is a powerful idea. When stress arrives, are we bitter or brave? Attitude is another choice that can greatly affect how we deal with stress. Are we complaining and openly spreading our discontent? Sharing and spreading the sour and unsettling energy of our distress? If things are actually as bad as our reaction to them (which they seldom are), then why do we need to compound it with a bad attitude? Do we want to be remembered as the stressed out person with a bad attitude? All these questions lead to shifting our outlook. If we can have a good attitude in challenging or stressful times then we win. Emotional composure and even cheerfulness in less than favorable circumstances are like superpowers. Knowing a problem or project doesn’t have the power to dictate our mood, only we do. Our attitude towards stress, and during stress, is what enables a eustress response versus a distress response. Accepting and moving past the added stress of fighting our circumstances will help us use our minds more effectively. With greater awareness of our choices in regards to stress responses, we can learn to improve those choices. Our attitude is always within our control. Even though it can be difficult, we can practice having a better attitude and outlook. Especially during challenging or stressful moments. Don’t be stressed out — be blessed out. The last piece of the puzzle is gratefulness. When we are stressed (distressed) we are often so focused on what we are afraid of or the unfavorable outcomes that might happen. When we want to choose eustress a simple way to shift our awareness, attitude and bring acceptance is through gratitude. Knowing that even as frantic as we have let ourselves become — we are blessed to even be alive. Being thankful feels so good and can be a direct counter-punch in the fight against distress. This is the 59th installment of Writing Wednesday — a project and practice where I dedicate time to my dream of “becoming a writer”. I am much more confident in saying that “I am a writer”, but without this practice I would not be. I am also working on a project I call the Depths of Gratitude a publication here on Medium with the sole focus of spreading thankfulness practices, stories, and content focused on the perspective of gratitude. If you, or someone you know wants to contribute in any way let me know.